As you know, our NIH Strategic Plan articulated an objective to “excel as a federal science agency by managing for results,” and to manage by results we must harness the power of data to drive evidence-based policies. Sometimes, however, our world can be complicated by requirements to enter the same types of data repeatedly in one system after another. These situations do have an upside: they provide us the opportunity to look for opportunities to simplify. If you are a researcher, you may have experienced the need to provide information about yourself, your work, the products of your work, and other basic profile information in one or more university, journal, society, or hospital-based systems. You may also be entering that information into your eRA Commons profile, profile systems for other Federal agencies, systems for non-Federal funders, publisher systems, and more. Each system asks for somewhat different information, making the data fragmented, burdensome to maintain, and hard to use. To address this complex issue, NIH has been exploring ways to better leverage data already available in the research sector. One organization that may be able to help is ORCID (Open Researcher and Contributor Identification). ORCID is a not-for profit organization that assigns unique persistent identifiers to researchers that supports automated linkages between researchers and their professional activities with the goal of helping people find information and to simplify reporting and analysis. Over 7000 journals use ORCID as part of their workflow, and – with the user’s permission – can automatically populate ORCID user accounts with citations when they publish. 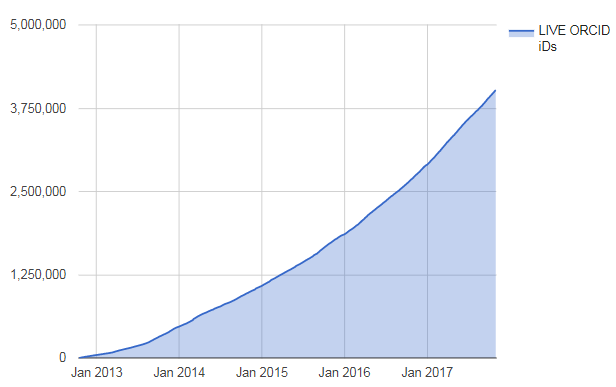 ORCID’s user base has rapidly grown since 2012 (Figure 1) and is now more than ten times larger than the user base for our electronic Research Administration (eRA) system. NIH applicants can already link SciENcv (Science Expert Network Curriculum Vitae) with their ORCID account to simplify the creation of a biosketch. Graph used with permission from ORCID. We are excited to announce an expanded integration with ORCID. eRA Commons is establishing a real-time link with ORCID, which allows users to associate ORCID with their eRA account. We encourage investigators who have not done so already to go ahead and create an ORCID profile, which takes about 30 seconds (creating a fully-fleshed out profile will take some more time). Next, link your ORCID profile to your eRA Commons account for continued success of this activity. Those who participate should expect to see additional functionality over time, such as assistance completing NIH applications and reporting requirements as well as allowing public data on NIH grant awards to populate ORCID. Further, NIH and other funders are collaborating on the ORCID Reducing Burden and Improving Impact Tracking (ORBIT) project. This effort will expand the ORCID data model beyond publications to data elements typically found on a CV, such as grants, courses taught, presentations, and other research products. ORCID promises to serve as a hub for these data. Users will be able to link their faculty profile, publisher, and funder accounts to ORCID. Moreover, ORCID will be able to verify and exchange data across all these systems, reducing burden for the user. We also foresee science networking services using these data, leading to more efficient and equitable ways for people to find reviewers, collaborators, and mentors. Moreover, this richer data will make it easier for the scientific community to create measures and incentives for better scientific practices such as openness, rigor, and impact. Combined with other strategies underway and with feedback from the research community, we can further ensure NIH remains proper stewards of taxpayer funds. Interested in hearing more about the partnership between NIH and ORCID? If so, we invite staff at institutions who manage faculty profile systems to join us for a webinar on Thursday, November 16th. This entry was posted in blog, Open Mike and tagged biosketch, citations, New Resources, publications by Mike Lauer. Bookmark the permalink. Will NIH choose to reduce the regulatory burden on us by having an automated system whereby an ORCID listing then puts information directly in to the NIHMS system and otherwise reduces the hassles and time burn of dealing with PMCID, etc etc?